Most people are familiar with tropical coral reefs, located in warm, well-illuminated, shallow waters. However, corals also exist hundreds and even thousands of meters below the ocean surface, where it is cold and completely dark. These deep-sea corals, also known as cold-water corals, have become a topic of interest due to conservation concerns over the impacts of trawling, exploration for oil and gas, and climate change. Although the existence of these corals has been known since the 1800s, our understanding of their distribution, ecology, and biology is limited due to the technical difficulties of conducting deep-sea research. DISCOVRE (DIversity, Systematics, and COnnectivity of Vulnerable Reef Ecosystems) is a new U.S. Geological Survey (USGS) program focused on deep-water coral ecosystems in the Gulf of Mexico. This integrated, multidisciplinary, international effort investigates a variety of topics related to unique and fragile deep-sea coral ecosystems from the microscopic level to the ecosystem level, including components of microbiology, population genetics, paleoecology, food webs, taxonomy, community ecology, physical oceanography, and mapping. 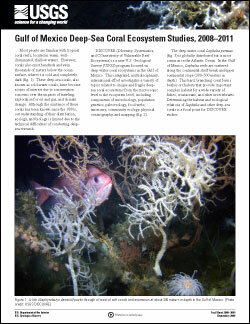 Kellogg, C.A., 2009, Gulf of Mexico deep-sea coral ecosystem studies, 2008–2011: U.S. Geological Survey Fact Sheet 2009–3094, 4 p.